It’s been a while since I’ve put anything here, but the journey to reduce plastic goes on – always looking for ways that can fit into normality easily and long-term. I have a (slimline) dishwasher, but since installing solar PV panels and adding a widget that uses spare electric to heat water, I find the appeal of free hot water too great to resist most of the time. So we wash up by hand instead of in the dishwasher, unless there are visitors and we can fill it from one meal. Until recently, my preferred item for doing the washing up was a sponge – the green plastic kind with a scourer on one side. They are obviously a poor option, and seem to be made shorter-lived now than a couple years ago so I’ve been hunting for an alternative. Some people automatically throw them out at the end of every week, which is not much better than single use. I personally don’t like washing with a dishcloth though many people do, and was looking around for an alternative. I had a SponTex cellulose sponge in the cupboard which, when cut in half, is a nice palm-sized piece. I looked up cellulose online, and find that it is re-processed plant fibres (usually wood), and both biodegradable and compostable. In use, it is far more absorbent than oil-based sponges so I use my dishcloth much less. Even so, I still knit my own dishcloths out of cotton or a bamboo/cotton blend. I tend toward colours as the white ones don’t stay white for long. I’ve found a nice choice of inexpensive colours of cotton at The Range, but I’m sure you can get them elsewhere. For some people, the dishcloth is all they want, but I prefer the sponge+scrub+cloth route. I like an absorbent dishcloth for wiping down, which will have different properties to one you would make for washing and scrubbing. On the Plastic-Less Living Facebook group, I saw the idea for cutting up a loofah to use for scouring. A loofah is only 1 from That is seeming to work very well, especially if something stubborn is soaked first. I don’t know how long it lasts, as it doesn’t get used very often. I haven’t come up with an alternative to washing up liquid, but I get eco types of liquid, in a large container to refill the smaller one on the counter. With using a washing up bowl and only half filling it, and not trying to have lots of suds, I find a half litre bottle will last months. My sister used to put the scrap ends of soap in a jar with a bit of water. She’d leave a dishcloth in there, use it to wash the dishes, then rinse them off. So that’s a possible alternative though it would take time to get going. 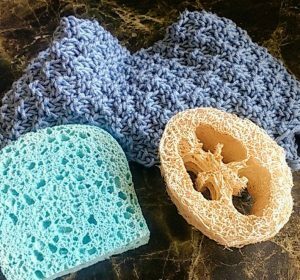 Rinse a sponge, loofah or dishcloth well in hot water after using, and leave in open air to dry out. If you use a dishwasher, sanitise your sponge daily by adding it to your regular load. At least once per week, leave your rinsed-clean item in distilled vinegar, or a weak bleach solution, or water with a few drops of essential oils, overnight. Put any of these in the weekly laundry in a mesh bag (so it isn’t inadvertently shredded and clog your pump) to freshen. Dishcloths, if needed, can be bleached or boiled (though keep in mind that chlorine is bad for you and the environment and get powdered bleach). If you notice a musty smell to the sponge or loofah which doesn’t wash out, time for the bin (or compost). I still have some plastic sponges left, but will keep those for the occasional grimy cleaning job where it needs to be tough and will be thrown out afterwards. I’ve been using these for several weeks now, and I see this as a viable long-term change for me.